I’ve talked over the last few days about the value of reviewing monthly bills and subscription services. Today, I’m going to look at two bills that people often think of as “untouchable,” but which essentially just boil down to expensive entertainment. I’m looking at you, cable/satellite bill. I’m looking at you, too, internet bill. Let’s look at each of these bills separately. First, a cable/satellite bill is purely for entertainment. There’s essentially no information that you can get from your cable box that you couldn’t get elsewhere, and honestly, the vast majority of what it’s used for is entertainment. The question is whether or not you could get equivalent entertainment (or information) from other sources. 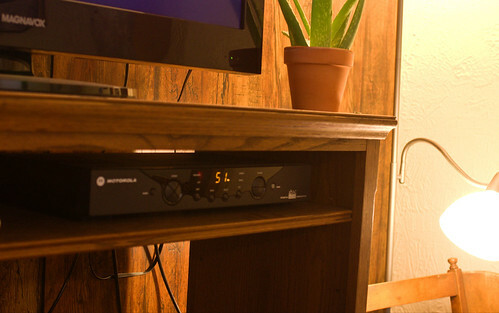 Is there anything you’re getting from your cable box that you couldn’t really get from your DVD player, a roof antenna, and a converter box – and no longer have a monthly bill? With just local television, you can get the necessary news and weather alerts and a wide diversity of programming (especially since, with the advent of digital television, you can get ten to twenty channels almost everywhere). With a DVD player, you have access to lots and lots of movies, especially in conjunction with a Redbox kiosk. What about the internet bill? I’ll agree that many people use the internet for work-related purposes, but it’s also used largely as a source of entertainment in the home. Web browsing, movie watching, gaming – they’re all forms of entertainment enabled by internet access. Again, can you find these entertainments elsewhere? Would a digital converter box and an antenna on the roof suffice for television programming? Could you use other resources, such as a library, for your other internet needs? For many people, these two bills add up to well over $100 per month. In some cases, the bill can touch $200 or $300 a month. That’s a pretty big impact on a person’s monthly finances. It’s well worth considering an alternative plan, at least in the short term, so that you can get control of your finances again. Eliminate the internet or the cable box (or both) from your home for a while and breathe a sigh of relief at the reduced monthly bills. For many people today, I’d suggest choosing the internet over the cable box if you’re choosing between the two. There is a lot of entertainment that can be found online – often enough to replace the regular programming given to you by cable or satellite services. Looking for another way to cut back on monthly entertainment bills? Consider cutting back on your mobile data plan. How often do you really use it for useful things that aren’t purely for entertainment? The goal isn’t to live a spartan lifestyle. The goal is to stop paying for stuff you don’t use – or things that you can already get through another service – and put that money to better use in your life.